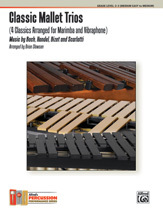 Classic Mallet Trios contains four classics arranged for marimba (two players) and vibraphone. Bizet's delightful "Habanera" from Carmen and J.S. Bach's soothing "Jesu, Joy of Man's Desiring" are two of music's most revered masterpieces. In addition, Handel's "Adagio" and A. Scarlatti's rhythmic "Folia" provide challenging contrasts in styles for percussionists. Wonderfully suited for solo and ensemble applications, these versatile gems will also thrill audiences in concert settings.